Google’s recently launched competitor to Yelp, Places With Hotpot, has today arrived on the iPhone. Google Places With Hotpot allows you to search for locations nearby based on a number of categories like restaurants, coffee shops, hotels, ATMs and tourist attractions. 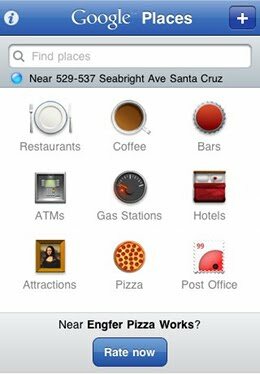 As with services like Yelp, you’re able to see top-rated locations nearby, rating and reviewing directly from your phone. The new iPhone app works exactly the same way to the Android app which launched in November. The release follows Google introducing Hotpot-based recommendations to Google Maps in the browser yesterday. On the web, Hotpot allows you to rate locations and it will even use your search history to pick out places it thinks you might be interested in. As a mobile recommendation service, it’s smart and incredibly useful. If Google ever gets around to launching its long-rumoured “Google Me” social service, it’s easy to see how Hotpot could be a key part of its featureset. Places With Hotpot is available in the App Store now for free.